After searching a while for a commandline music-players for linux and testing them I just settled down with cmus. 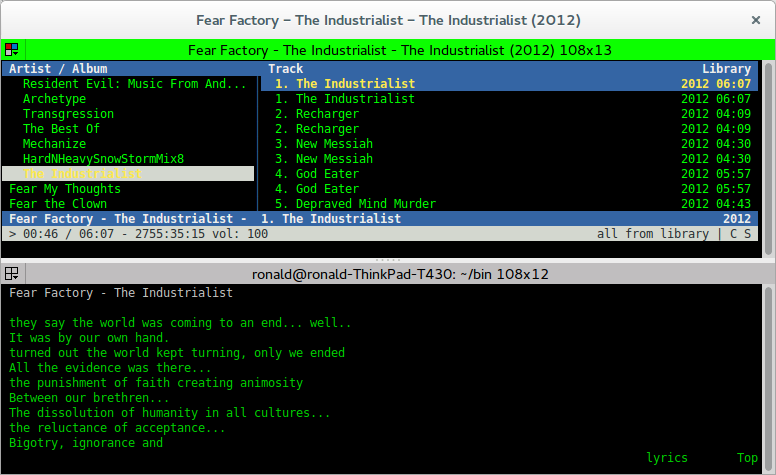 Cmus is a feature rich music-player built using ncurses which provides a nice commandline based GUI. Since I wanted a lyric module for the player I added lyvi which is a simple command-line lyrics viewer for various audio players. Alternatively, if you want the latest cmus version you can clone the repository from github and build it yourself. The lyvi installation is a bit more work since you need to download and build it yourself, which includes downloading and building some dependencies as well. For this demo I’ll install lyvi into ~/bin which is already part of the PATH variable. We now install the packages in reverse order starting with libffi. We download and unpack libffi into ~/bin/lyvi_ and then follow the libffi install instructions. After that we need to download and unpack glib into ~/bin/lyvi_ and follow their install instructions. Now that we have all its dependencies we can download and install glyr following their instructions. The last step is to download and install lyvi itself, as always following the install instructions. After that you are basically finished, for convenience I would recommend to add a small start-script or an alias for lyvi. If you now run lyvi (typing lyvi.sh) and cmus, lyvi fetches the lyrics for the song cmus is currently playing (see image below). Be aware though that cmus has to be started before lyvi! For a quick-start with cmus there are many good sources showing an overview of basic usage e.g. [1-2], for an in depth functionality description see the man page . This approach was tested using vagrant and amplifi/ubuntu-desktop-14.04.minimal.